Tailgating Together: Welcome, Louisville. The ACC, and Clemson in particular, welcomes you! 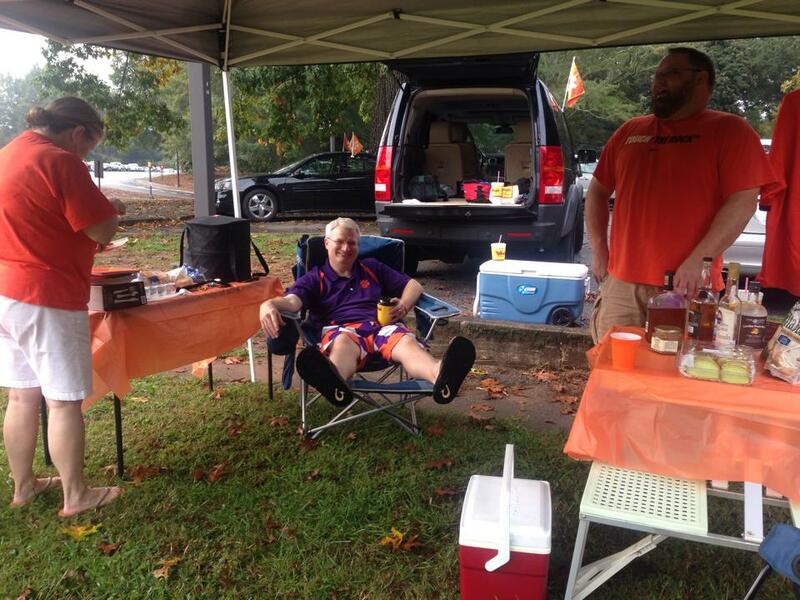 While not a true “She Ordered What?” experience, I did have some terrific tailgate food on my trip to Clemson last weekend! But, let’s face it, I just want to take a little time to boast on my weekend in Clemson and show my pride for my Alma Mater! 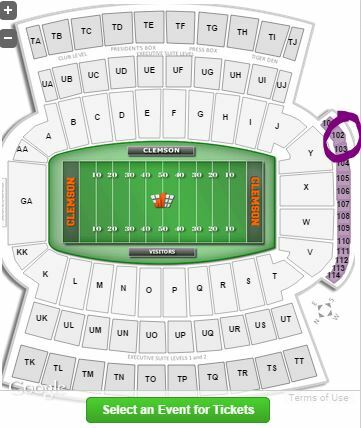 For my first Clemson game of the season, my friends and I decided to join up for “family weekend” when the Louisville Cardinals visited Death Valley for the first time as ACC foes. I want to commend the Cards fans for showing up in spades for the game. There were a lot of red jerseys, shirts, etc, and a lot of Cardinals pride on campus last weekend. We had some Cards fans in the lot in which we tailgated, and they were as lovely as Clemson fans are notoriously known to be! Gracious and polite folks. Speaking of gracious and polite, here is a photo of my friend and game weekend hostess, Cindy. I took this shot on Friday night at my friends’ Cindy and Alan’s house. We were preparing some of the fixin’s for the next day. 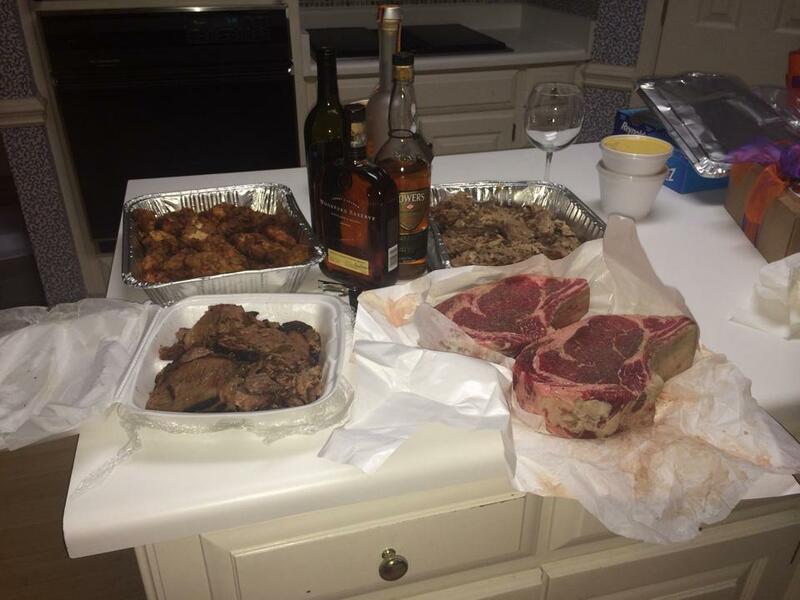 BBQ and bourbon! It’s how tailgating is done in the south. After Alan graciously picked me up at the airport, he and I stopped at the market on the way back to the house. I bought some pre-made salad (weak! ), green beans (which we forgot to make! ), Golden Delicious apples for my “favorite snack recipe“, baked potatoes, and a couple of other treats for the weekend (hello – jalapeno artichoke dip!!!). Dennis had already arrived at the house by the time Alan and I were heading back. 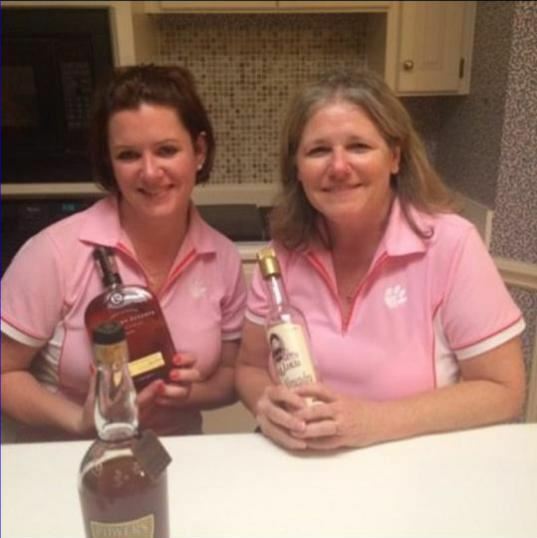 When we got back, it was quickly decided that more booze just might be required – namely bourbon. Dennis is a bourbon aficionado (aka: polite snob), so I was happy to send the men to the liquor store while I took a nap! And, they did well! Woodford Reserve found its way back to the counter. Our steak dinner on Friday night was fantastic! I was so wrapped up in enjoying time with my friends that I didn’t take any pictures – but, trust me, it was delicious! Alan is looking quite relaxed! As evidenced above, Cindy had ensured we had Southern style pulled pork, brisket and Calabash chicken, which we shared with our tailgate neighbors. SO GOOD!! We also had a plethora of side dishes and snacks (again, I was remiss in taking photographs). Then, came game time… My favorite college roommate, Bill, came by our tailgate area and offered up tickets to the West End Zone Club (catered suites with a private bar (which, after that game, I OWE HIM!!)). This gives a perspective as to our vantage point during the game. 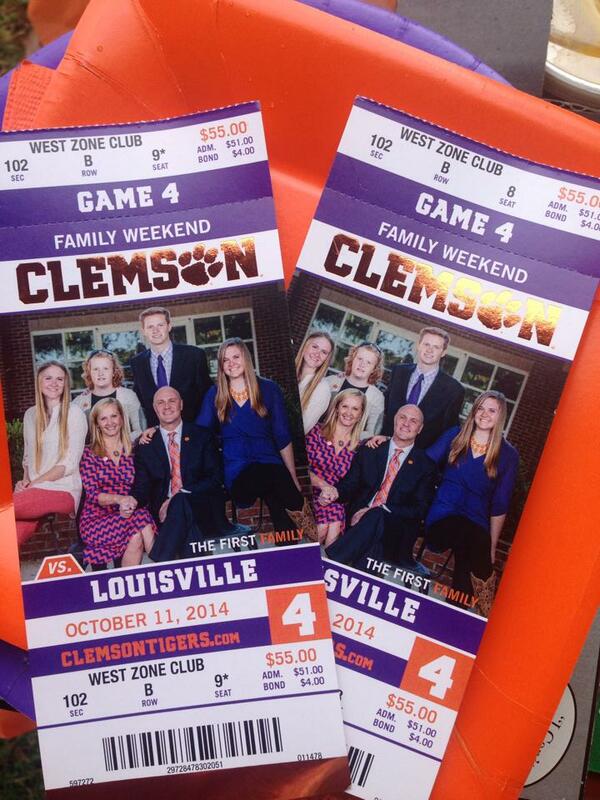 In response to comments from Louisville head coach Bobby Petrino, Clemson fans were “#ClemsonLOUD” from start to finish. The atmosphere was incredible, as Clemson always is! Though there were certainly some negatives to the day (losing our QB1 for several weeks, botched plays, etc), the positives far outweighed those negatives, and ultimately, the Tigers pulled off the win! And, I would find myself without a voice for two days following that game! 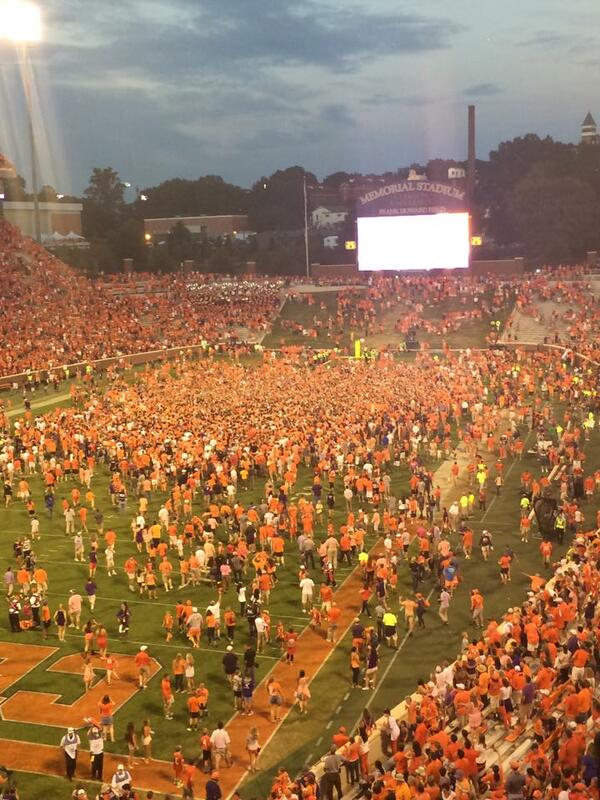 Fans headed for the Gathering at the Paw – a Clemson post-game ritual. 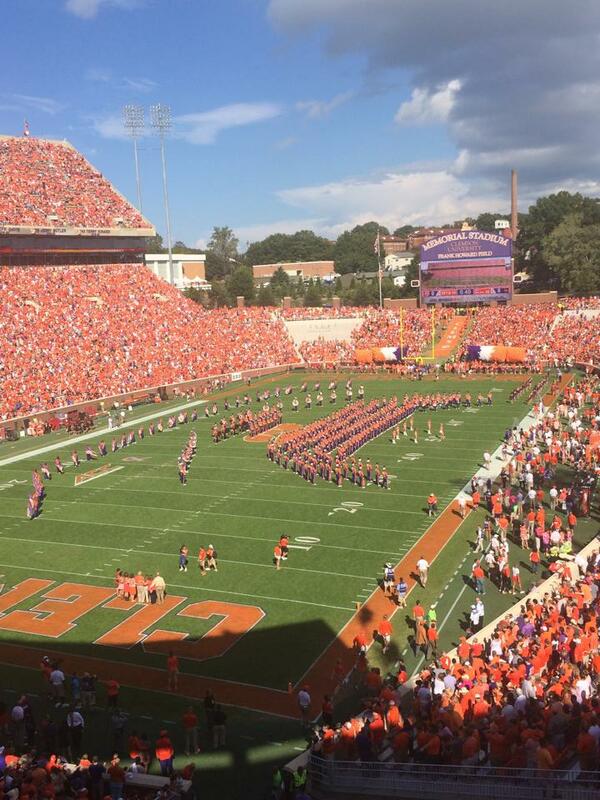 Win or lose, Clemson fans have a tradition of “Gathering at the Paw” to sing the Alma Mater and show our Clemson pride! Another wonderful weekend of fun, friends, and football in the books! And, to those friends with whom I wasn’t able to meet up, hopefully in November!